What is the Meaning Behind the Mercedes-Benz Logo? Founded almost a century ago by Karl Benz and Gottlieb Daimler, Mercedes-Benz and its logo have a long and rich history. Both men were avid mechanics and engineers with a series of accomplishments to their names. In 1886, Benz built a motorized tricycle, and not long after, Daimler constructed a horseless carriage. About a year after the merger, thousands of Mercedes-Benz vehicles were being produced. In 1931, the Mercedes-Benz W15 (also known as Typ(e) 170) debuted at the Paris Motor Show and performed so well that its sales persisted even after it was discontinued in 1936. The success of the W15 helped put Daimler-Benz on the map. Like the brand itself, the Three-Pointed Star has undergone a series of changes over the years. Allegedly, the design first came from the Daimler family’s postcards. Initially, the star was gold, white, and finally, silver. The Three-Pointed Star of today is simple and straightforward: silver with a sleek circular border. Each of the three points corresponds to land, sea, and air—representing the superiority of Daimler engines. Meet the New Mercedes-Benz Lineup in Las Vegas! Want to learn more about the history of Mercedes-Benz and its Three-Pointed Star? 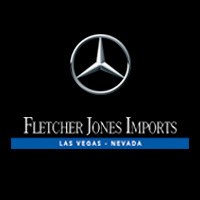 Contact us at Fletcher Jones Imports in Las Vegas. Schedule a test drive near Summerlin and Paradise to get acquainted with our new vehicles! 0 comment(s) so far on What is the Meaning Behind the Mercedes-Benz Logo?